It is both painful and cathartic to admit this in print and in the very first sentence of our introduction: This book is one of the hardest, most challenging, and most stressful projects we’ve undertaken. One part was simply the physical and logistical implications we experienced- writing close to 115,000 words, gathering more than 2,500 images and their respective release forms, and keeping track of the 3,500 emails we wrote, not to mention facing the writing deadlines we embarrassingly had to push back time and again. The other part of this gestational burden—and the one that bears most heavily on us despite the joy of finishing the project—is that the book is, relatively speaking, incomplete. At the outset, we established that Graphic Design, Referenced would serve as a metaphorical clearinghouse for graphic design information, covering its basic principles, formative history, seminal projects, and influential practitioners. But, as we soon found out, it was impossible to cover everything, be it for time constraints, the limitations of our already generous page count, the availability of reproducible images, or the participating consent of designers or those holding the rights to the work, putting us in a position where for every dozen successful inclusions there were a handful of upsetting omissions— and we realize the latter are as significant as the former in a field as rich and diverse as graphic design. These conditions, however, don’t exempt us from criticism on the conscious exclusions we made. If asked politely, we will be happy to explain our position, whether it was blissful ignorance or premeditated judgment. Of course, this is not all irremediable: Pending the success of this first edition (wink, wink), many of these gaps could be mended. The final content of the book is the result of a constantly fluctuating whirlpool of names, terms, typefaces, methods, events, brands, magazines, and numerous other verbs, nouns, and proper nouns that act as reference points for graphic designers-hence the title. 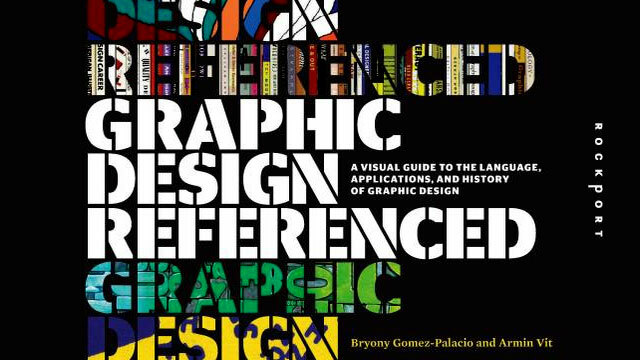 Adopting the word reference allowed us to look at graphic de- sign in two ways: first, as an acknowledgment of how graphic designers colloquially reference their own history, constantly pointing to particular designers or specific projects as sources of inspiration or comparison; and, second, as a challenge to create a book that serves as an authoritative reference of both textual and visual information, documenting and chronicling the scope of contemporary graphic design. Perhaps a better way to explain the book is with our elevator pitch: If you find yourself in the sole company of graphic designers, this book will likely address every professional subject that might arise, giving you enough information to laugh at an inside joke or nod in knowing agreement at a thoughtful reference. Because the material of this book treads territory similar to that of Philip B. Meggs’s A History of Graphic Design, Richard Hollis’s Graphic Design: A Concise History, and even the latest entry into the historical survey category, Stephen J. Eskilson’s Graphic Design: A New History, we sought to differentiate our content—which wholeheartedly builds on these giants’ shoulders—by offering a new organizational perspective through which we can parse our past and present while offering new inclusions from the growing canon of our profession. In “Principles,” we look at the foundations of graphic design to establish the language, terms, and relatively objective concepts that govern what we do and how we do it. In “Knowledge,” we explore the most influential sources through which we learn about graphic design, from the educational institutions we attend to the magazines and books we read. With “Representatives,” we attempt to gather those solo or group practitioners who, over the years, have been the most prominent or have steered the course of graphic design in one way or another. Finally, through “Practice,” we highlight the iconic work that both exemplifies best practices and illustrates the potential legacy of the work we produce. With this framework in place, we forged ahead in filling in the nearly 500 blanks through a combination of comprehensive (although admittedly not exhaustive) bursts of text and—testing our puzzle-solving skills—as many images as the layout was willing to accommodate. Despite the aforementioned stress and challenges, this has been a thrilling book to define, research, write, and visualize. While this may not be every- one’s idea of a good time, we loved immersing ourselves in the world of graphic design. Design books, sporting dozens of Post-it notes, are scattered through our office; our scanner always has a queue of materials waiting to be digitized; our Web browser history is miles long; the U.S. Postal Service, UPS, and FedEx are constantly delivering packages containing original design artifacts that designers have sent us or that we have purchased on eBay; our transfer server is endlessly active with uploads and downloads of files; and we have used this project as an excuse to visit graphic design archives in our vicinity. It may sound corny and perhaps paradoxical to the opening paragraph, but this has been an unexpectedly enriching experience. The result is a book we believe—or, at the very least, hope—provides an informative, energetic, and nimble point of view on the many facets of our profession. We are neither historians nor critics, simply practicing designers who acknowledge the importance of being aware of the path our profession has taken so it can be steered in new directions. This book is ultimately a reflection of our own formative experiences, and its content represents what we have found important, relevant, and influential over the course of many years. We are anxiously confident and eagerly unsure about the relevance and reception of Graphic Design, Referenced-but we trust it will serve as a worthy stepping-stone, for us and the profession, to forge a new history and practice in the twenty-first century.